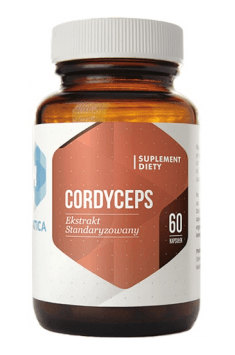 Hepatica Cordyceps is a dietary supplement with a high-quality Cordyceps sinensis extract, standardised to contain polysaccharides and adenosine. The product belongs to superfoods and shows strong adaptogenic, tonic and anti-stress properties. It influences beneficially immune function and glucose balance. It is recommended especially to persons who may be involved in intense physical and mental activity and is effective in fatigue and loss of vitality. It may be also used to prevent cancer. Cordyceps (Cordyceps sinensis), or caterpillar fungus, is a species of parasitic fungus native to regions in Nepal and Tibet. It has been used for ages in Chinese herbal medicine. Europeans became better acquainted with their properties in 1993. At the Olympics in Beijing, Chinese female runners were admired for their good form and results. It turned out that all competitors took Cordyceps sinensis mycelium extracts. Scientists have analysed in depth phytochemical composition of cordyceps and detected a number of compounds with pharmacological effects. Cordycepin and adenosine were identified as the most important. A major role is also played by polysaccharides, beta-glucans, phytosterols, and flavones. In addition, cordyceps is abundant in vitamins and minerals. Cordyceps boosts the body’s immune system. It increases the proliferation of such immune cells as T lymphocytes, NK cells and macrophages and stimulates their activity. They are the first line of defence of the body against pathogens and are also responsible for removing mutated and abnormal cells which may be the root cause of cancer. Furthermore, cordyceps promotes the production of interleukin-1 and TNF-α that are critical to the body’s adaptive immune response. Cordyceps has been demonstrated to have anti-cancer potential. On the one hand, it boosts the immune system and stimulates the body into fighting against cancer. On the other hand, it has an impact on carcinogenesis. Scientists have isolated numerous compounds from the mycelium of Cordyceps sinensis which have a cytotoxic effect on the cell line of melanoma and prostate, lung, liver and breast cancer. These compounds promote the apoptosis of mutated cells and inhibit the proliferation of abnormal cells and angiogenesis. Cordyceps shows antihyperglycemic properties. It may be used to as a preventive measure against type 2 diabetes. It stimulates the activity and secretory function of pancreatic cells responsible for insulin production and increases the sensitivity of tissues to insulin. Consequently, it helps lower blood sugar levels. Cordyceps boosts physical performance. It is recommended especially to athletes who want to improve their performance. It functions by activating AMPK, thereby leading to an increase in cellular ATP levels. Efficient ATP production results in adequate energy levels for effective function of the whole body. Some studies suggest that cordyceps may aid in increasing lung capacity and oxygen utilisation in the body. Cordyceps has a beneficial impact on cardiovascular health. It restores normal heart rhythm and prevents arrhythmia. What is more, it promotes the relaxation of vascular epithelium, consequently improving blood flow. It is also very important that it has the ability to regulate the lipid profile and lower LDL cholesterol levels because abnormalities in the lipid profile are considered a significant risk factor of cardiovascular diseases. Cordyceps is a known adaptogen. It helps reduce negative effects of chronic stress and makes it easier for the body to build up the resistance to any kind of stressors (biological, chemical, physical and mental). Studies show that cordyceps regulates the release of cortisol, the main stress hormone. As a result, it is secreted in accordance with a stimulus. Cordyceps helps enhance sexual function. It is used often in traditional Chinese medicine to treat sexual dysfunction and decrease in sexual desire. It promotes testosterone production and influences positively libido and sexual performance. It may be used to boost fertility – studies show that regular supplementation with cordyceps helps increase sperm count and viability. To sum up, Hepatica Cordyceps is a valuable supplement with a very high safety profile. It will be effective in the prophylaxis of diseases of affluence and metabolic disorders and immunodeficiency. Athletes can use it as a natural way to improve their physical fitness and increase endurance of the body. Take 1 capsule two times daily. Studies have shown that even long-term use of cordyceps extract does not entail the risk of toxicity. There are no detailed dosage guidelines. As a general rule, experts suggest doses of 1000 - 3000 mg daily. It is therefore recommended to take 2-4 capsules per day. They can be taken as a single dose or divided into smaller doses. Some studies indicate that high doses of cordyceps may increase the risk of bleeding. Because of that, individuals diagnosed with coagulopathy should consult their doctor before taking this supplement. Hepatica is a young Polish producer dealing with the highest-class natural products. Its specialty is a range of plant preparations, devoid of unnecessary supporting substances. The quality of each of them results from proper selection of materials, high content of active substances, the dose adjusted to the needs and form of a given dietary supplement. The heart of the company is its founder, a renowned physiotherapist and co-founder of Nature Laboratory, SławekRasiński, who derives his inspiration and knowledge from around the World. Numerous travels and acquaintances with doctors and herbalists from all continents fruit, changing in dozens of unusual, effective and also often innovative preparations, on which a large board of analysis specialists work in the best prepared laboratories. Strong probiotic with chocolate flavor. It helps the proper functioning of the digestive system.